A war memorial at one of the country's oldest boarding schools has been vandalised. 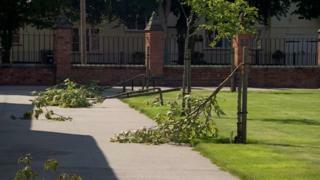 Loughborough Grammar School said someone broke into its campus at around 21:30 BST on Friday and snapped a number of cherry trees. They were planted eight years ago and have a plaque at the base of each with the names of former students and staff who died in conflict. The school said the town had been "really offended" by the vandalism. It has released a CCTV image showing the suspect breaking down one of the trees. Jane Harker from the school said: "These trees are not just important to the school, but to the wider community. "We have had so much response, not just from our own community... but from the wider community of Loughborough. "They are really offended by the fact that anyone would desecrate a war memorial." The trees were dedicated last year to mark the centenary of the death of a former headmaster's son at the Battle of Gallipoli. Ms Harker added it would be difficult to replace the damaged trees with something of a similar stature. A Leicestershire Police spokeswoman said the force was aware and is investigating. She said: "We were called on Saturday morning, it had happened approximately 21:30 BST the night before." Officers are appealing to anyone with information to get in touch.